Soldiers of the 82nd Airborne prepare for their historic D-Day jump. 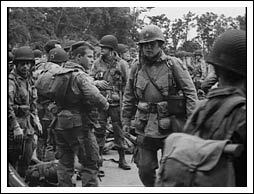 On June 6th, 1944, over 13,000 U.S. paratroopers would jump into Normandy including more than 2,000 men from the 507th PIR. 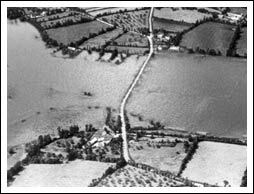 The flooded La Fière causeway was crucial to the advance of Allied forces coming ashore at Utah Beach. Over 500 soldiers from various 82nd Airborne regiments were killed or wounded in the battle for the causeway. 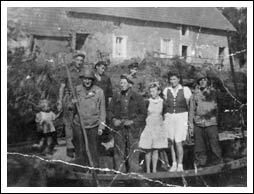 Residents of Graignes, a small village in Normandy, pose with Allied soldiers. Because of the widespread dispersal of the paratroopers on D-Day, over 150 members of the regiment ended up in Graignes, many miles south of their mission objectives. 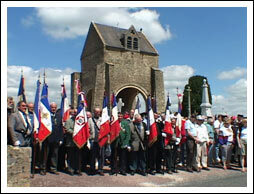 Residents of the Graignes area attend a ceremony in July of 2002 to honor the veterans of the 507th PIR. In the background are the ruins of the town church, destroyed during the war. Today, the ruins contain a memorial for the Allied soldiers and French citizens who lost their lives defending the village. 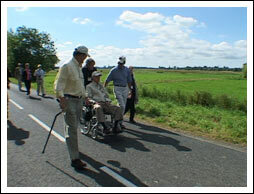 Robert D. Rae, veteran of the 507th PIR, re-visits La Fière causeway with family and friends in 2002. Rae and fellow members of his regiment played a pivotal role in capturing the causeway from German forces on June 9th, 1944. 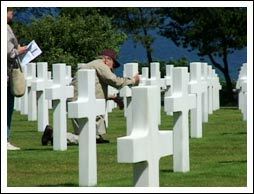 Bob Bearden, veteran of the 507th Parachute Infantry Regiment, kneels at the cross of a friend lost during the war.